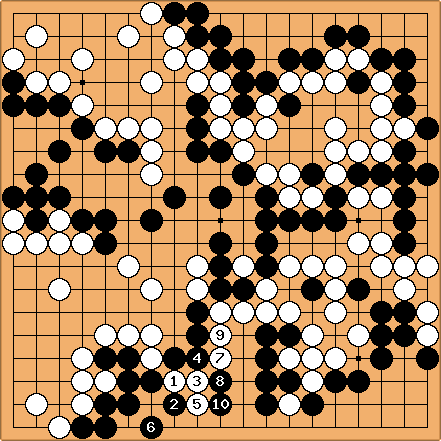 After Black decided to play a sente move at . White replied with ; and Black played . That was a mistake. Punish. MarcGaudet I don't understand why it was a mistake, it stopped white from invading, right? White was very happy to close the territory and penetrate with in the previous diagram in sente. But White missed an opportunity. is bad. threatens the placement at . HolIgor: Bill's answer is correct, of course. Yet, one of the variations features a snapback. Bill: I believe I have found an improvement for Black. connects. Now if , . Qi B can play at 2.